- Do you add sugar to any of your almond milk flavors? No refined sugar is added to our milks. Raw local honey is used as a sweetener in all our milks except our pure. - What kind of water do you use? - What kind of almonds does Rawmond Milk use? We use organic, raw almonds from a farm in Northern California (we tried so many different almonds before we chose this one to ensure we picked the best of the best). - Why does Rawmond Milk have a shorter shelf life than other almond milks on the market? We are committed to keeping our product as close to its natural state as possible. We do not pasteurize our product or add any preservatives or chemicals to extend shelf life. - Why is Rawmond Milk unpasteurized? If we pasteurized our product it would no longer be raw. 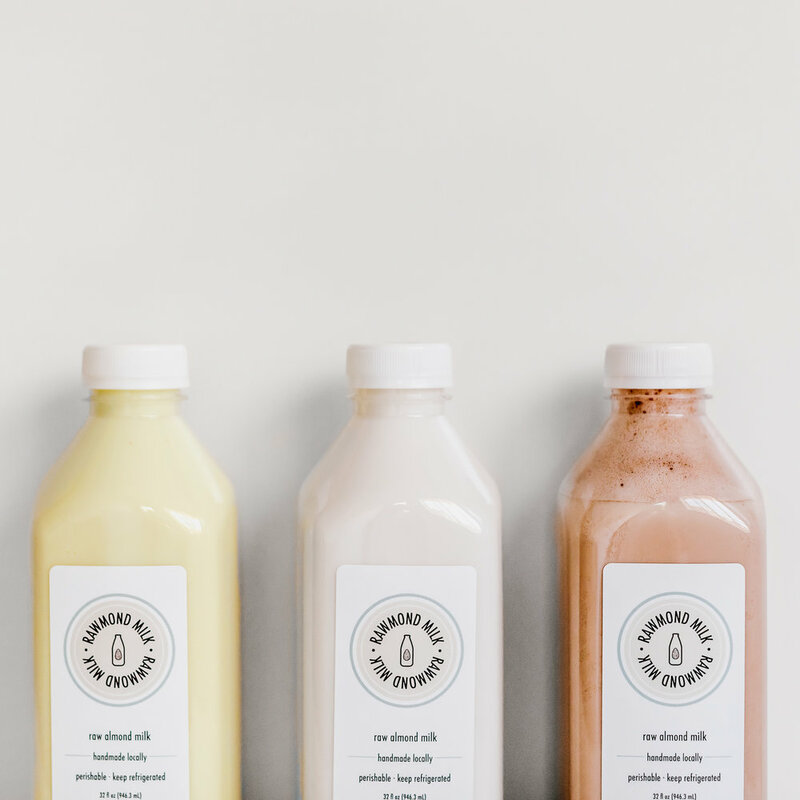 The process of pasteurization involves heating and consequently destroying many of the important vitamins and minerals present in the raw product. - What does sprouted mean? All almonds naturally contain phytic acid. It holds mainly phosphorus, but also calcium, magnesium, iron, and zinc and is found in most grains and seeds (almonds aren’t botanically a tree nut but a seed). Unfortunately, our bodies lack the necessary enzymes to break down this phytic acid meaning that we cannot absorb all these wonderful vitamins and nutrients. So what can we do to fix this problem? Soak and sprout our almonds. To break down the phytic acid and break free the vitamins and minerals so our bodies can use them we soak and sprout our almonds. This allows us to be able to fully digest and absorb all the goodness found in almonds. - Is Rawmond Milk suitable for Vegans? Yes, our almond milk does not use any animal products. However, if honey is present it will be clearly identified on the ingredients list. - Can I freeze Rawmond Milk? While we don’t recommend freezing our almond milk, it has been tried and tested and found to be effective. We cannot guarantee the same shelf life if frozen. Remember to remove some milk beforehand to allow for expansion once frozen. - Does Rawmond Milk need to be refrigerated? Yes! Our milk is a raw and unpasteurized product with no preservatives or additives and must be refrigerated for optimum shelf life. - Why is Rawmond Milk more expensive than other brands out there? Our question to you is, how is everyone else’s almond milk so cheap? Making almond milk the right way is expensive. We pay more to source only organic, raw, pesticide-free nuts. Unlike a lot of cheaper almond milks, our product is handmade. Moreover, the percentage of almonds in most other brands is significantly lower than ours. We make it our mission to bring you the real, natural goodness that comes from the almonds themselves and do our best to make it as affordable as possible. We love you and want to give you the best we can. - What can I use almond milk in? Everything! You can replace it for regular milk almost everywhere. We use it in smoothies, cereal, pudding, baking, coffee, cooking, and the list goes on. It is also pretty great just by itself right out of the bottle if we do say so ourselves. Well for one, it is delicious! It is also lower in calories, contains no saturated fat or cholesterol, and is naturally lactose free! We also make it ourselves so it is not subject to the same processing as the almond milk in stores would be which means more nutrition for you. Almond milk has a very high nutritional value. Since it is made from almonds, most of the nutrients found in almonds are also present in almond milk (of course!). It has a high number of vitamins and minerals, including magnesium, phosphorus, potassium, iron, zinc, calcium, vitamin A, vitamin D and omega -3 and -6 fatty acids. It also contains 50 percent of the recommended daily amount of vitamin E, which contains antioxidant properties essential to your skin’s health! - Your product separates, is this okay? YES. This is perfectly normal. Because we do not use any preservatives or chemicals to keep this from happening, the denser nut layer separates from the water. All you need to do is give the milk a quick shake, and it will be good to go (and back to looking silky smooth)! - What if I get a batch that went bad sooner than the expiration? Oh no! We are so sorry! Because we use raw, unpasteurized, organic almonds, sometimes one bad almond squeezes its way into the batch. It is not harmful to you in any way but because it may be bitter it may cause the batch to, well, taste a little funny. Bring it right back to us and we will replace it for you free of charge! - I have a question not on this list! We apologize. We want to provide you with as much information as possible so if your question was not answered here, please get in touch and we will do our best to give you any further information you may need. See our contact page and drop us a message!